Treat your guests to something that will please both their ears and their funny bones. 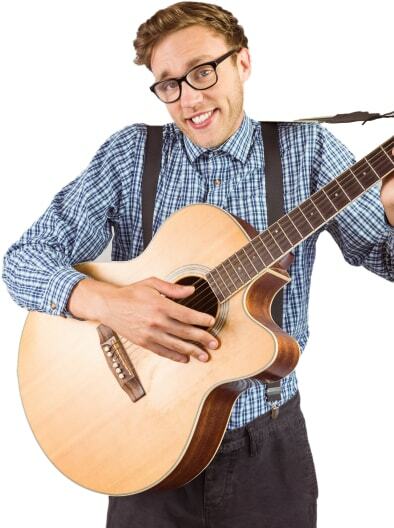 If you're a fan of comedians like Adam Sandler, with his SNL hit "The Hanukkah Song," and Weird Al Yankovich, with the always-hilarious "Amish Paradise," then you'll love these musical comedy acts. Watching one of them is way better than going to your favorite concert or seeing a hilarious stand-up comic. These folks can seamlessly combine great music with even better punch lines. Your guests won't know whether to laugh or sing along. Give 'em the best of both worlds by hiring one of these gut-busting musical comedy acts right here on GigSalad. Private party, corporate event, trade show... or whatever event you’re trying to plan, musical comedy acts or parody musicians are the perfect way to make your event memorable. The only criteria for your audience or guests is that they've gotta be ready to laugh. And laugh hard. These singer/comedians can take popular songs and make hilarious parodies that might even be specific to your event. They often-times write original music too! If this has gotten your ears perked up, then how about'cha take a few minutes to watch videos, listen to audio, check out photo galleries, and read reviews of different musical comedy act to ensure you book the perfect entertainment for your next event.